In modern, fluid society, when toxic conflict corrodes relationships, we're often more likely to move on than to patch things up. But as we have become more specialized professionally, our worlds have shrunk. And as you move up in the organizational hierarchy, the number of places to which you can move declines. For many, moving on is no longer as easy as it once was. 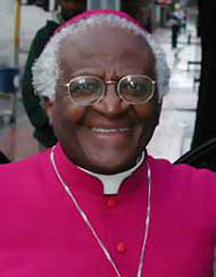 Archbishop Desmond Tutu, chairman of the Truth and Reconciliation Commission of the Union of South Africa. The TRC is widely regarded as having been responsible for guiding the nation along a path from truly toxic conflict to peace, following the end of Apartheid. The principles they created and followed have provided a model for truth commissions around the world. Person-to-person reconciliation is more intimate than national reconciliation, and in many ways, more complex, but the TRC model is still a valuable and inspiring guide. Read more about South Africa's reconciliation experience. Photo courtesy Mogale City, South Africa (Tutu's home town). Between people, coming to peace after heated, venomous disagreements is a valuable, if undervalued, skill. How can you come to peace if you're engaged in a long-running feud with another? Here are some suggestions. Sometimes we can't imagine ever getting back to comity, and even if you would like to, it might not be possible. But go as far as you can for today, and building on that, strive to go a little further tomorrow. Each party must find a way to respect the other. It isn't really peace if one side grovels while the other triumphs. Such a peace is just war continued by other means. You can't undo what's happened. Your experiences were real. Instead of denying the past, find ways to acknowledge the truth of what happened between you, as honestly as you can. Truth is essential to forward progress. Work together to find a path that works for Now. Agree that whatever happened in the past happened Then, and that it isn't happening Now. Whatever path you find has to fit for both of you, and one of you is your Self. Value your integrity and your sense of ethics. Trying to walk a path that you simply cannot walk doesn't work. Forge an agreement you can live with. How the two of you work out your difficulties is your own business. Offer (and ask for) confidentiality if you need it. Confidentiality between the two of you can provide a strong bond that can be part of the basis for going forward together. Find things you each can contribute to build a strong foundation for your new relationship. Use the amazing test: if you were a third party, and you somehow found out the terms of the new agreement, would you be amazed at its inventiveness and mutual generosity of spirit? Try to build an enduring relationship. If you cannot imagine a peace enduring for a year on the basis you're about to agree to, it won't last. Make the foundation stronger. Would you like to see your comments posted here? rbrenfLyKFRiKChZDoIfSner@ChacRCNdGAaPQurRYoeEoCanyon.comSend me your comments by email, or by Web form. I offer email and telephone coaching at both corporate and individual rates. Contact Rick for details at rbrenkgLBDjFqOAWLBwuUner@ChacYVumtszXtjFCGzkHoCanyon.com or (650) 787-6475, or toll-free in the continental US at (866) 378-5470.